To kick-off #CookoutWeek, I have the easiest and so super easy recipe to give to you all! It is for Grilled Truffle Oil Potato Wedges! Oh my, these so delicious and what is even better, you can prepare these in less than 15 minutes! Yum! 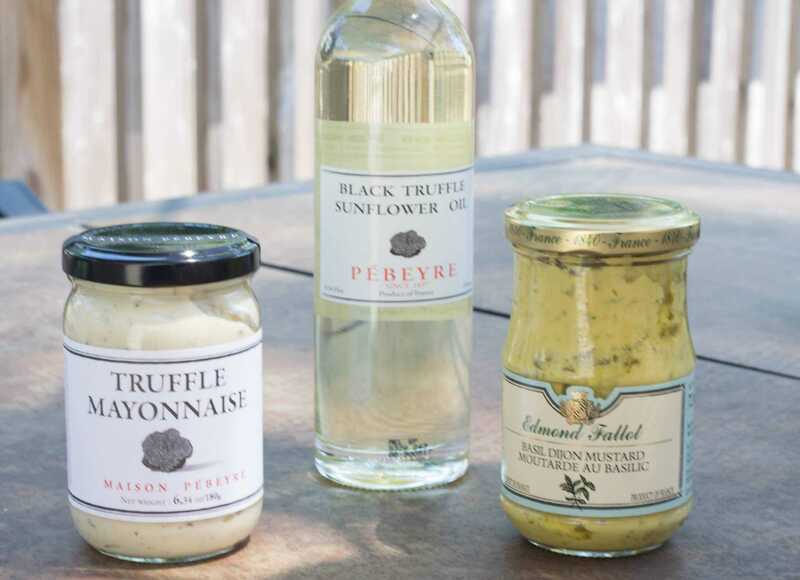 The amazing folks over at The French Farm sent me a few special treats including Black Truffle Sunflower Oil! They also sent me Truffle Mayonnaise and Basil Dijon Mustard! You have to check out the amazing products on The French Farm‘s website! Great products from honey to kitchen accessories! I hope you go to my earlier blog post regarding #CookoutWeek! I have teamed up with an amazing group of bloggers and we are spending the week providing some delicious recipes that would be great for the 4th of July and any time of year! Pre-heat your grill to about 400 degrees. 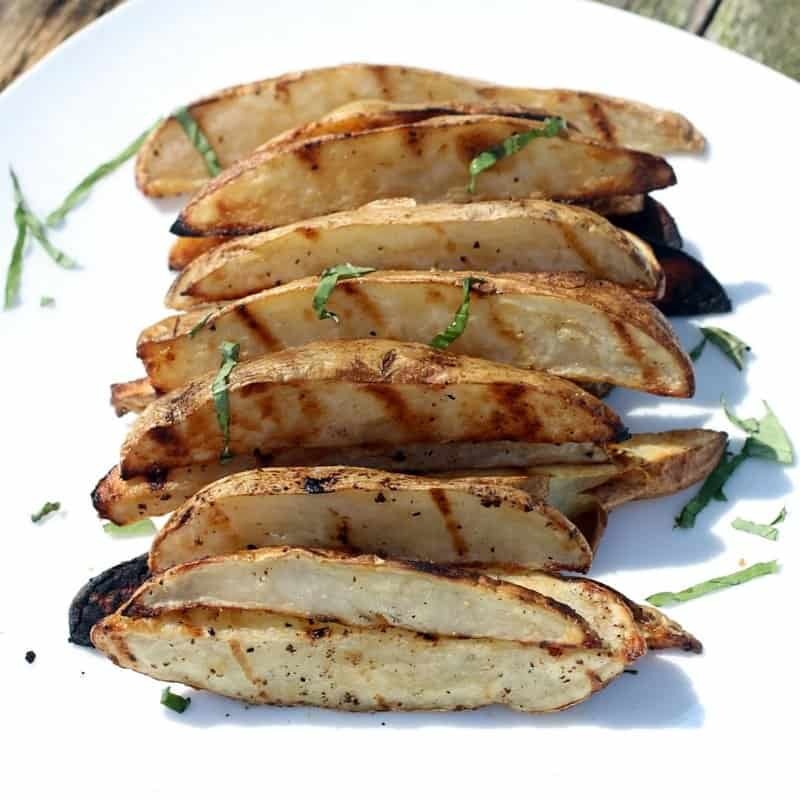 While the grill heats, Wash and cut potatoes into wedges, about 1/2 inch thick. In a medium bowl, combine sliced potato wedges, olive oil, garlic powder, onion powder, salt, and pepper until the potato wedges are well coated. Turn the grill to about 375 degrees, medium heat. 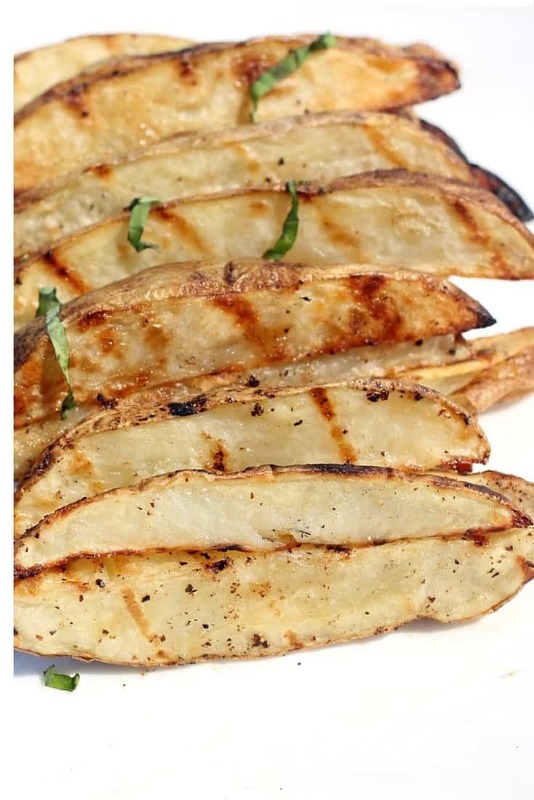 Place potatoes on the grill and let them cook at least 5 minutes, so grill marks show. Then adjust potato wedges to get criss-cross marks on potato wedges. Potatoes should be done between 10-15 minutes. Remove potatoes from grill to a bowl. Drizzle black truffle oil on the grilled potato wedges. Toss to combine. Serve. These potatoes can be prepped ahead and reheated. Wrap the potatoes in foil and place on indirect heat on the grill. Also can be reheated in the oven. Again, wrap potatoes in aluminum foil and reheat at 300 degrees for about 10-15 minutes. I have made them in the am. Reheated when ready for dinner. So easy. Can serve with any dipping sauce or ketchup. Click on these amazing #CookoutWeek recipes below for more inspiration! These are the best-grilled potatoes. So easy and they reheated really well! You have made my day Marilyn. Glad you enjoy! Oh man I want these right now for lunch! I love grilling potatoes during the hot months. These sound wonderful Eileen.